What does nForce 780a have on offer? Things had been a little quiet on the AMD front for some time, and rightfully so - with Intel's Core 2 line-up trumping the competition, why would anyone look elsewhere? That, however, is beginning to change. With the launch of AMD's Spider Platform in November 2007, which introduced us all to its 7-series chipsets - 770, 790, 790FX and, now, the 780G - AMD-based systems have shown a lot of promise. Furthermore, AMD's latest batch of Phenom X3 (tri-core) and X4 (quad-core) processors are showing signs of a new lease of life for the semiconductor manufacturer. Though admittedly not as quick as the competing Core 2 Duo and Core 2 Quad parts, AMD's Phenom chips now offer a value alternative to dominant Intel. AMD, now with solid chipsets, top-to-bottom graphics solutions, and much-improved processors in its arsenal, is looking to be the cost-effective platform that does do it all. So, where does AMD's platform leave NVIDIA's nForce chipset? 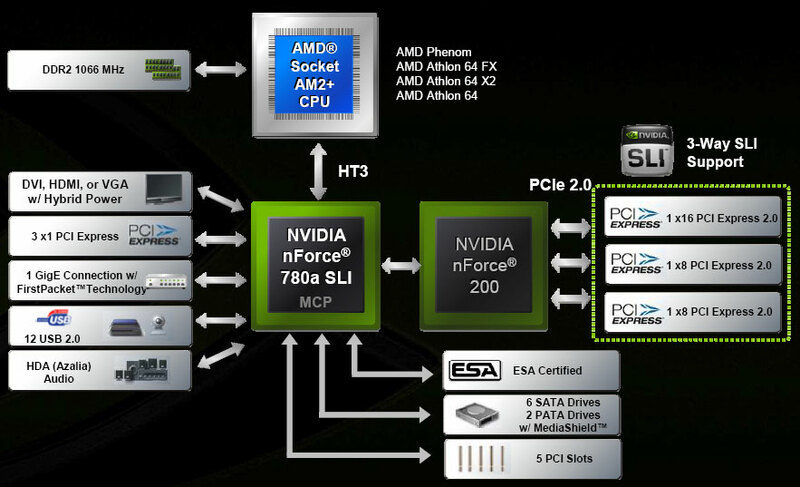 Well, historically, NVIDIA has been one of AMD's biggest supporters, and after a sparse year or so, it continues to move forward its AMD-based chipset solutions with the launch of its nForce 700 series, topped by the new nForce 780a SLI. NVIDIA's nForce 780a chipset, previously codenamed MCP72XE, is designed to compete against AMD's own 790FX chipset, and provides key features such as 3-way SLI support, Hybrid Power technology and the addition of the nForce 200 PCIe bridge, as found on the nForce 780i SLI.. There's support for all of AMD's AM2+ processors, including all of the latest Phenom chips and support for DDR2 1066MHz memory. Wanting to make the most of AMD's Phenom chips, the 780a MCP provides a Hyper Transport 3.0 interface to the CPU. Thinking of the graphics subsystem, the nForce 780a SLI motherboard provides 3-way SLI, as opposed to AMD's quad-CrossFire capable 790FX. Unfortunately, the nForce 780a utilises the nF200 for PCIe 2.0 support. We'd have preferred the MCP to take PCIe 2.0 responsibility, though. 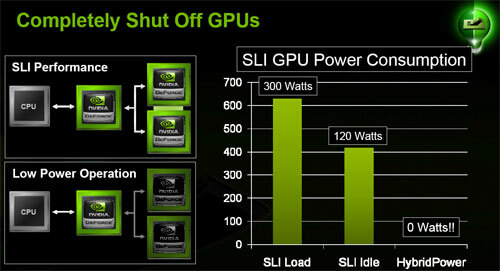 What sets the nForce 780a apart, however, is its integrated GPU and Hybrid SLI functionality. It could be argued that users of an enthusiast board won't be looking for an on-board GPU and that power-saving may not be a priority. However, the nForce 780a's Hybrid SLI allows for the on-board GPU to be utilised when graphics-hungry applications aren't in use. Users with an additional one, two or three discrete graphics cards will find their GPUs called upon only when required - resulting in greatly reduced power consumption and significantly lower noise levels. As with NVIDIA's 790i chipset, the nForce 780a features what NVIDIA terms as PWShort (Post-Write short), useful in an SLI environment, providing a fast path for point-to-point write traffic from any one GPU to any other GPU, thus no longer wasting precious memory bandwidth, and, of course, reducing latency. In addition, the CPU Broadcast path allows a single-CPU write to target multiple GPUs, reducing unnecessary CPU-GPU traffic. Connectivity and expansion opportunities are in plentiful supply. There are 12 USB 2.0 ports, a gigabit network MAC, six SATA-II ports and two-channel PATA. As NVIDIA's high-end AMD board, you can expect to pay the premium when NVIDIA's partners bring their boards to retail. There will be the lower-cost nForce 750a for users without a need for triple SLI, and nForce 730a as the budget offering. Here at HEXUS labs, we've managed to get our hands on an MSI's nForce 780a SLI motherboard, the K9N2 Diamond, are we're currently putting it through its paces for our forthcoming review. In the meantime, head over to the next page to get an up-close look at MSI's layout and bundle.